Glorious detail I must say. WOW GUYS!! BEST CHARACHTER EVER! I'm still hoping for Hector Baboso. I just found out about this project tonight as I was playing a game and wondering how hard it would be to put TS on my PC! Super psyched to hear about it! Go! Go! Go! This project is looking amazing! I truly commend you guys! Just BEAUTIFUL! Btw how can i get a so called job? And design would be great! Great work so far. I really appreciate the hard work you're all putting in. Is the map editor going to be available and is this going to be online multiplayer only? I have a lot of experience in modeling in programs like Blender. I know it may be very 'Noob' but I am a huge fan of Timesplitters to this game. I wanna get involved!!! If there is ANYTHING I can do to help, I will do it. For free. I wanna see this game happen more than anything. PLEASE!!! If there is anyone in the Rewind team that reads this and is open to suggestions and possibly modeling I would help in a heartbeat! Love what y'all are doing!!! Keep doing what you're doing. 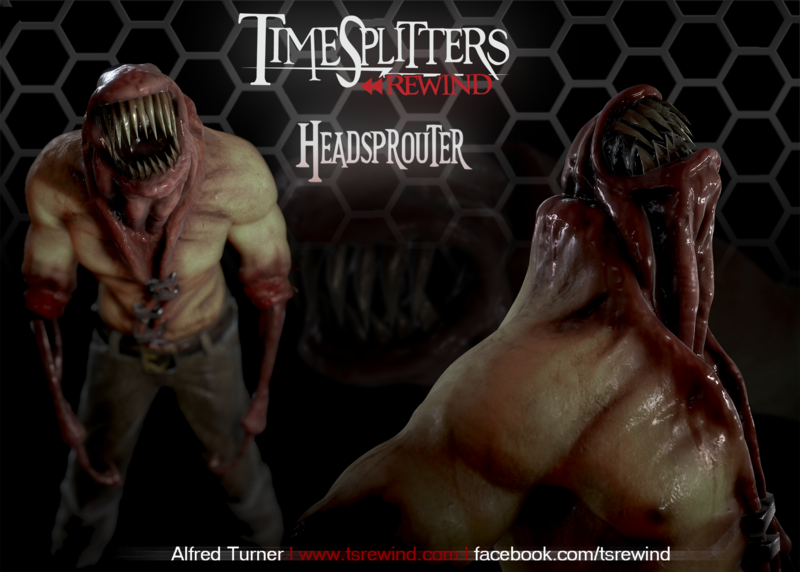 This is an amazing look to Headsprouter in the current gen. The Future Perfect Characters are my favorite in general, but I'd just perish of TS geek attack if you included the TS2 zombies (Soviet and Notre Dame) and The Impersonator.